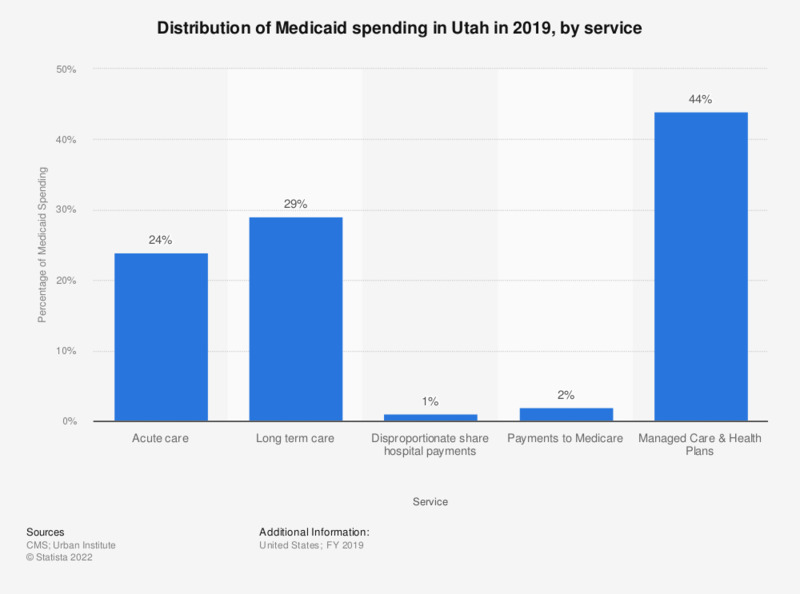 The statistic represents the distribution of Medicaid spending, by service, for the state of Utah in 2017. Approximately 21.9 percent of total Medicaid spending were used for acute care, during this period. Expenditures do not include administrative costs, accounting adjustments, or the U.S. Territories. Total Medicaid spending including these additional items was $576.6 billion in FFY 2017. Figures may not sum to totals due to rounding. Federal Fiscal Year runs from October 1 through September 30. For example, FY 2013 refers to the period from October 1, 2012 through September 30, 2013. Acute care services include inpatient, physician, lab, X-ray, outpatient, clinic, prescription drugs, family planning, dental, vision, other practitioners' care, payments to managed care organizations, and payments to Medicare. Long-term care services include nursing facilities, intermediate care facilities for the mentally retarded, mental health, home health services, and personal care support services.